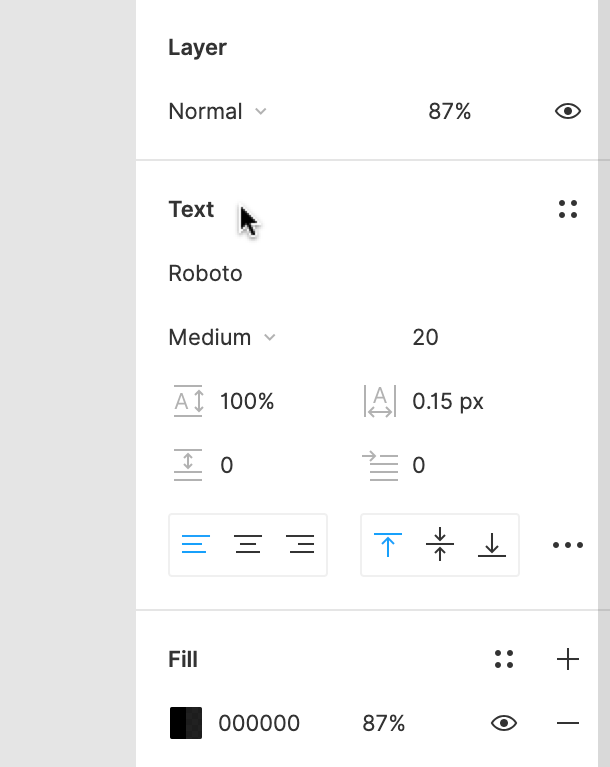 Figma automatically gives you access to an extensive catalog of Google Web Fonts, but you can also access to a number of other custom or locally stored fonts, allowing you to choose the perfect font for your project. Fonts can be applied to an entire text object, a number of selected text objects, or a selection of letters or words within a text object. Select the text object(s). Learn more about Selecting Layers and Objects. The current font will be displayed in the first field at the top of the Text section. In our screenshot above, this is Roboto. Once you've chosen your font, any selected text objects will be updated. 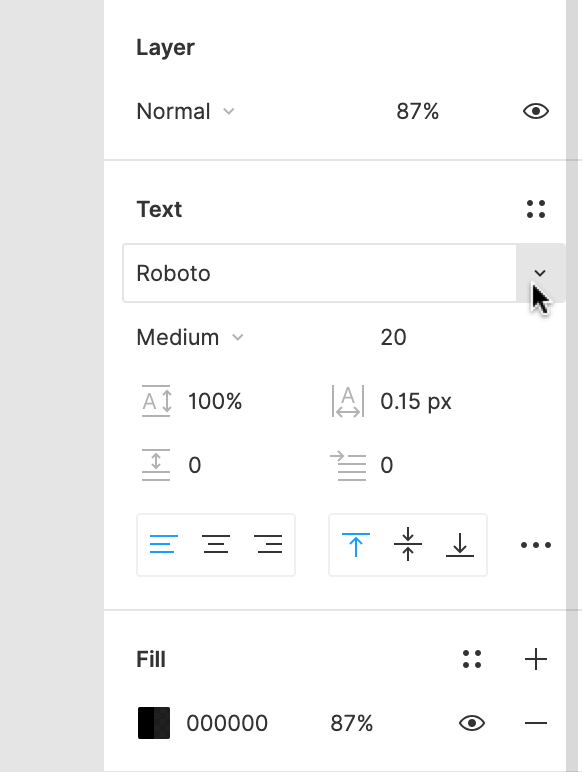 If you would like to use additional fonts in your Figma designs, that aren't included in the list of Google Web Fonts, then you can use fonts that are stored locally on your computer. Tip! 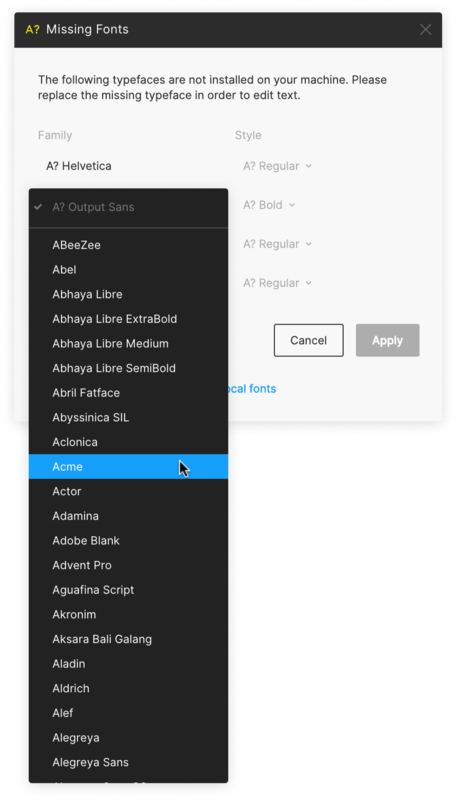 Adobe Typekit fonts are supported on devices running macOS or Windows 10. If you're not seeing these on your Windows laptop, ensure you are running the latest version of Windows. 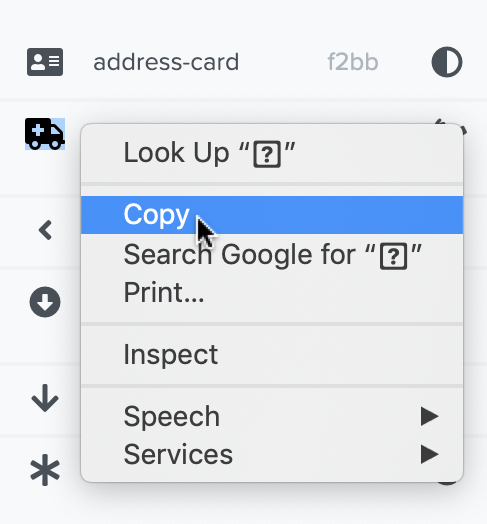 If you're using the Figma Desktop app, then any locally stored fonts will already be available to you. These can be found alongside the Google Web Fonts in the Font Picker. If you're using Figma in the browser, then you will need to install the Figma Font Helper application. This allows you to access any locally stored fonts in the browser. Click on your name in the top-left corner. Select Account Settings from the options. Tip! 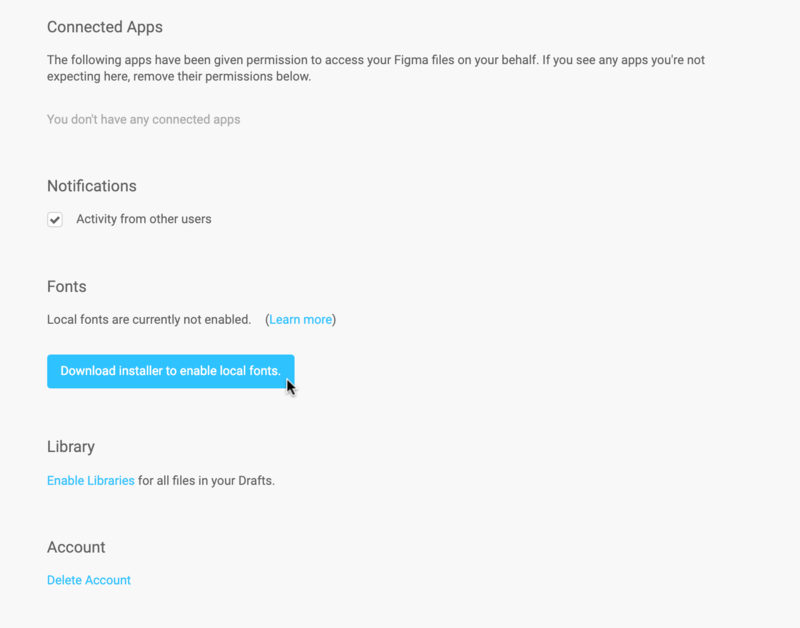 To uninstall the Figma Font Helper you can return to this same screen and click the Download Uninstaller to Disable Local Fonts link: Run the uninstaller and complete the on-screen instructions. Note: Using Local Fonts is not currently supported on Linux (e.g. Ubuntu) or ChromeOS (e.g. Chromebook). If you are part of a larger company or organization, then we recommend checking out Figma Organization. 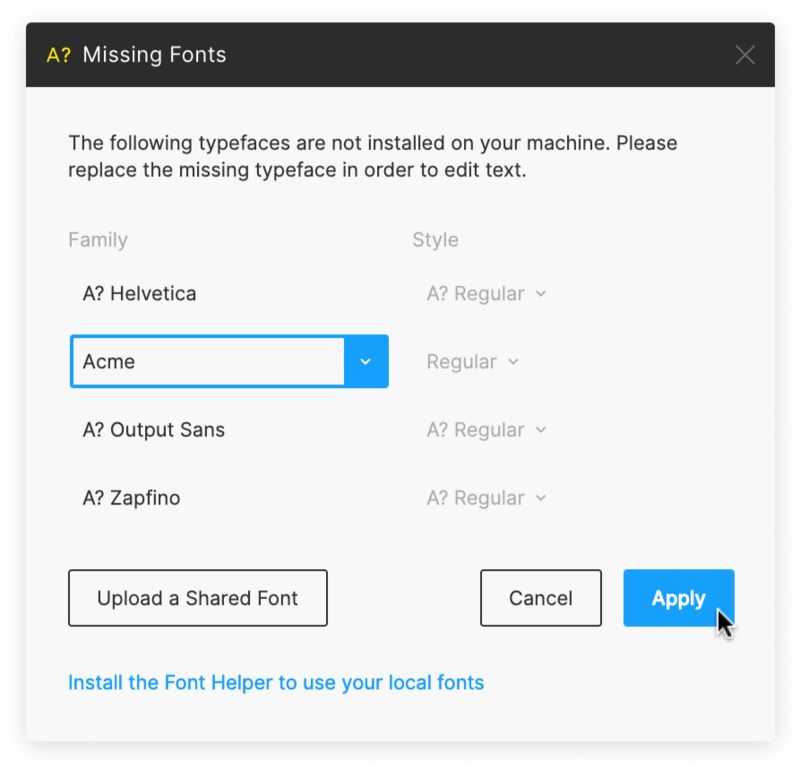 Professional accounts rely on every individual user having a font locally installed on their machine. 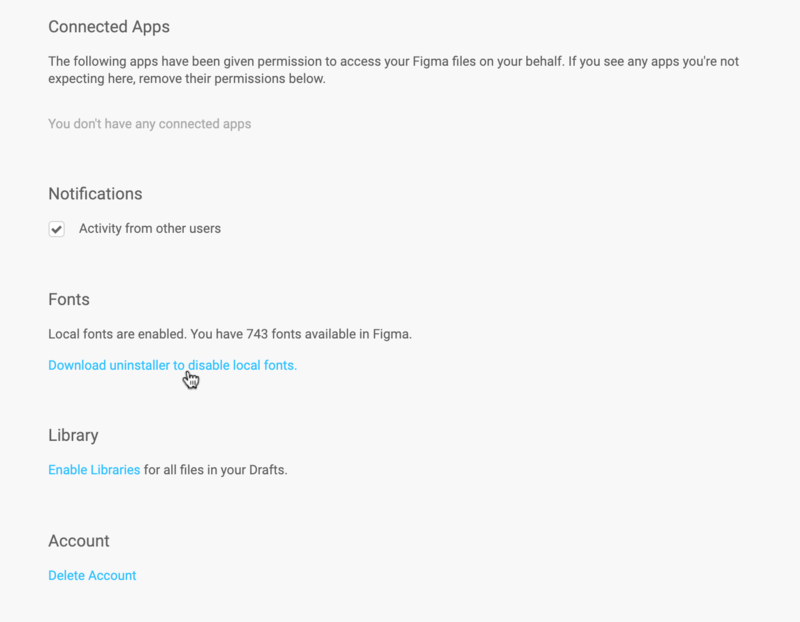 However, Figma Organization allows users in an Organization to access and use shared fonts within a specific team, or across the entire Organization. 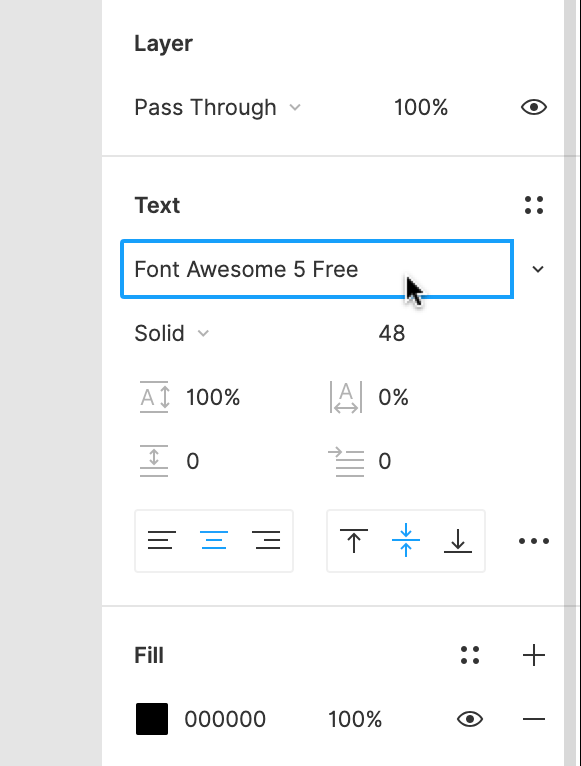 By default, Figma already supports Font Awesome, a popular and easy-to-use set of icons. 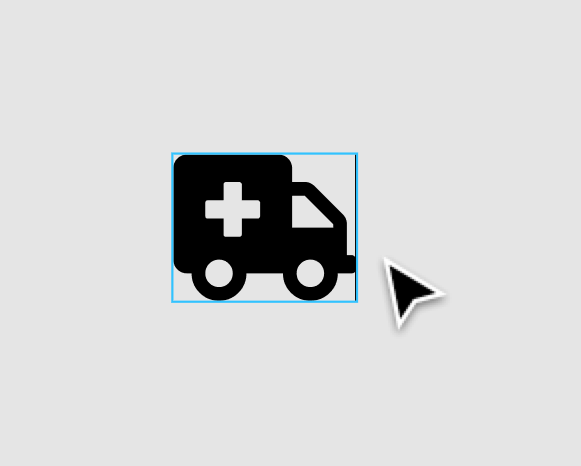 If you'd like to use other icon based fonts with Figma, then you can do this using Local Fonts. This will require you to have a copy of this font installed locally on your device. Once installed, any icon fonts will be available in the Font Picker alongside your other fonts. Create a text object in the Editor. In the Text section in the Properties Panel, click the down arrow next to the current font. OpenType is a cross-platform format for scalable fonts. It was developed in collaboration between Microsoft and Adobe. Note: If a specific font does not support a particular OpenType feature, then adjusting these settings will have no effect. This appears when you attempt to edit any text that uses that font, not when you first load the File. Other collaborators have been using Local Fonts that aren't available on your machine. A collaborator is using a different version of the same Font, either an older or a newer version, which is not accessible to you. Install or update any missing fonts on your computer (that you are licensed to use). Note: Option 2 will update the File for all collaborators, including those with access to the original font, so proceed with caution! If you would like to update all affected text objects, so that they use an available font, you can do this via the Missing Font modal. 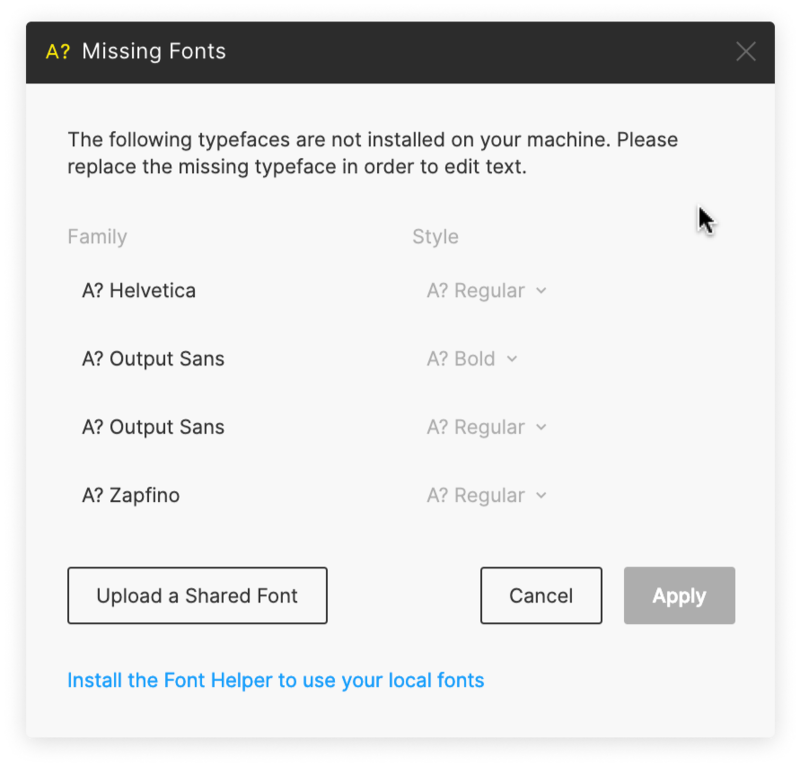 The Missing Font modal will list every font style in the File that is missing or unavailable. You will be able to see both the font Family and the Style. 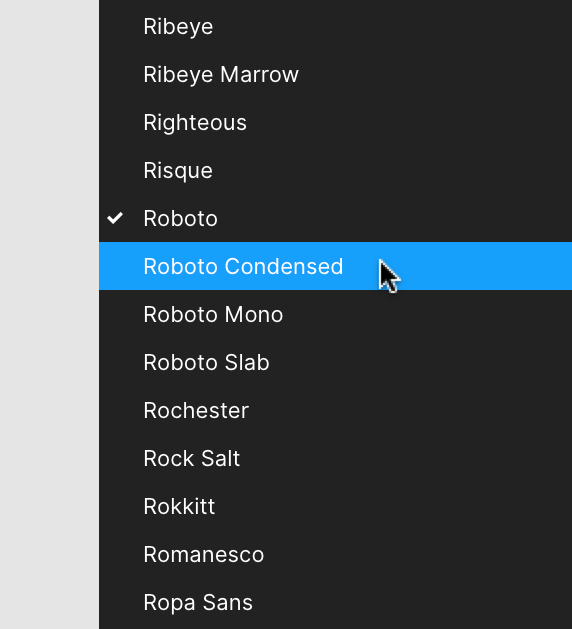 Figma will attempt to match the Style to the missing font, but you can use the dropdown next to the Style to change it to another Style. Complete the process for any remaining missing fonts. All text objects in the File will be updated to the new fonts.